As I suspected, some of the keen birders out there were straight on the case and GrrlScientist (unsurprisingly to me) immediately knew the species and an awful lot about its taxonomy, offering helpful hints and clues to other commentators. After some discussion it became clear that this is a Finch and one of the Neotropical varieties at that. 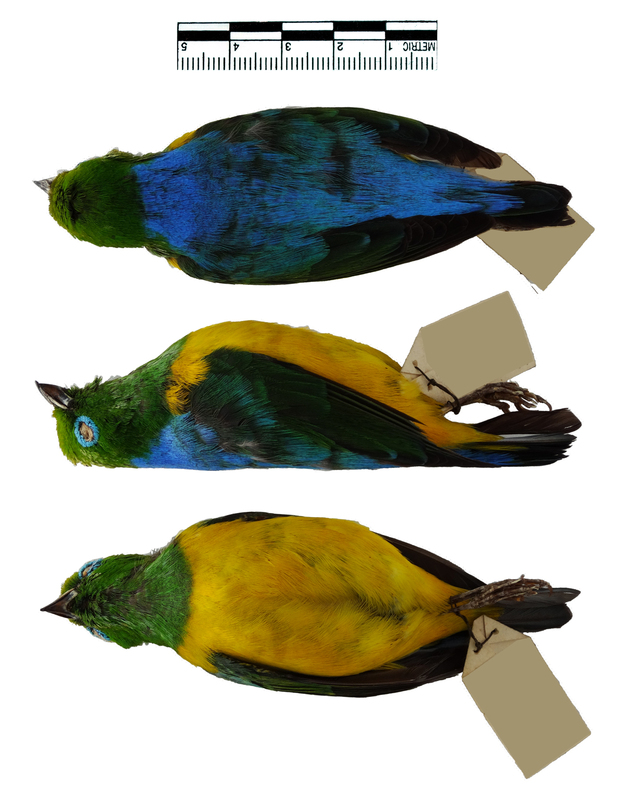 The bright yellow belly, emerald green head, throat, chest and wing, brilliant blue nape, back and eye ring all suggest that this is a male Blue-naped Chlorophonia Chlorophonia cyanea longipennis (Du Bus, 1855) from Peru. There are other subspecies of Blue-naped Chlorophonia, but they have some slight differences in appearance, such as a yellow forehead, yellow tinged crown or green feathers in the mantle. So a big well done to everyone who managed to work it out! It looks like an insect/arthropod eater — unusual for a finch. While searching for diet info I’ve found that many of the on-line references are out of date & still have it as a Tanager. No luck on the diet info though.